Disc golf course designs are very flexible. The scope of your project, target audience, and your imagination all play an important role in defining the “personality” of your course. A simple 9-hole course can be built on as little as two acres for around $3500. You can expect to utilize one to two acres per hole for a championship caliber course. Disc golf courses can be installed in phases and upgraded over time. Concrete tees, benches, trash cans, practice targets, alternate pin placements, and bridges are all features that can be added after your course is first established. Investing in a course designer can be the best investment you make in your disc golf course. Look to spend $400 per hole for a designer’s services. This will usually include marking tees and target positions, flagging trees for removal, and sketched out maps of the course and individual holes with appropriate par for the course. The cost is a bargain over the life of a well designed course. Targets are the most important piece of equipment for your course. Innova targets are highly visible, good looking, great catching and long-lasting. The DISCatcher® PRO28 is approved by the Professional Disc Golf Association for Championship Level play. Tees provide a surface from which disc golfers “tee off”. Tees should be as maintenance-free and slip-resistant as possible. Choose a tee (natural, artificial, or concrete) that suits the needs of your course and budget. Innova can recommend options and provide instructions. Tee signs provide information such as the par, distance, routing, and any obstacles for the hole. There is a tee sign option to fit every budget. Don’t forget to budget for additional items such as bags of concrete, locks, weed-killer, wood for tee forms, gas for power equipment, and even chainsaw blades. Budget more time and effort for wooded holes that require tree cutting and clearing. Open holes should require much less preparation. While you may have all the resources to build your course; equipment, materials, labor; you may be missing one aspect that can increase your exposure and also help balance your bottom line. 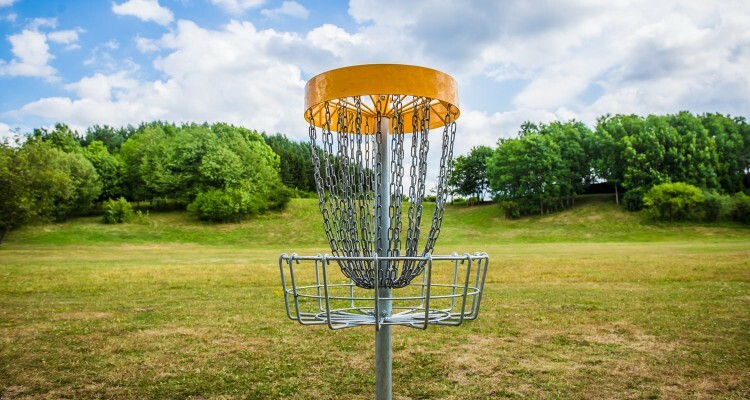 Working with a promoter can help you build connections to the disc golf community and generate sponsorship that can reduce your investment initially and over time.